It’s always nice when a journal editor actually uses words the way they’re meant to be used instead of employing euphemisms. In 2009, the African Journal of Biomedical Research published an article on the differences in heart rates when people ran backwards versus forwards. Unfortunately, five years later, the journal found out the paper was a reproduction of a 1994 Medicine & Science in Sports & Exercise paper. They contacted the authors and, when there was no response, published a straightforward and fairly detailed retraction. According to managing editor Babafemi Olaleye, the original paper was received and handled by the founding editor of the journal. In April 2014, the managing editor of Medicine & Science in Sports and Exercise emailed the journal, stating that the paper had been copied wholesale. It has been determined that most parts of the body, tables, figures, and references of the paper published in May 2009 edition of the African Journal of Biomedical Research (2009;12(2):95-101) were copied verbatim from a 1994 edition of another journal Medicine & Science in Sports & Exercise [1994;26(1):89-94] published by the American College of Sports Medicine. As this is a direct violation of copyright, plagiarism, and ethical norms, we therefore wish to retract this paper from the published archive of the African Journal of Biomedical Research. The authors of the paper were duly communicated on this decision. We apologise to the peer reviewers of this paper on the valuable time spent in reviewing the said article. The understanding shown by the Managing Editor of Medicine & Science in Sports & Exercise is highly appreciated. Dear Drs A.M. Adesola and M.O. Azeez,On 11th July 2014, I forwarded a mail sent to the African Journal of Biomedical Research by Kenneth O. Wilson, Managing Editor of a journal published by the American College of sports Medicine (Medicine & Science in Sports & Exercise). The details are as reproduced below: It is recently discovered that authors A.M. Adesola and M. O. Azeez published “Comparison of Cardiopulmonary Responses to Forward and Backward Walking and Running” in the African Journal of Biomedical Research [2009;12(2):95-101]. However, the article, tables, figures, and references are copied verbatim from Medicine & Science in Sports & Exercise [1994;26(1):89-94]. Reproduction of the Medicine & Science in Sports & Exercise paper in the African Journal of Biomedical Research is a direct violation of copyright, plagiarism, and ethical violations by Drs. Adesola and Azeez. As a matter of professional ethics and courtesy, I request that the article “Comparison of Cardiopulmonary Responses to Forward and Backward Walking and Running” be removed from the African Journal of Biomedical Research Web site. Having waited for six months without any reply and consequent upon establishment of an outright plagiarism of the article earlier published in Medicine & Science in Sports & Exercise, it has been decided that the said article (Comparison of Cardiopulmonary Responses to Forward and Backward Walking and Running” Afr. J. Biomed. Res (2009). 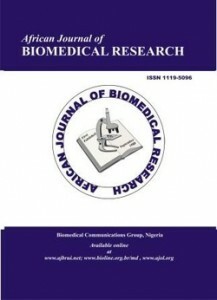 ;12(2):95-101) be retracted from the publications of the African Journal of Biomedical Research. The official retraction notice will be published in the next issue of the journal. 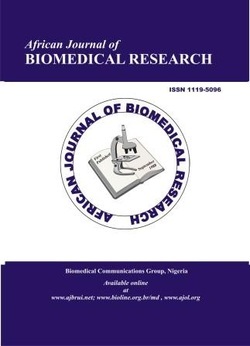 While appreciating you for your interest in publishing in the African Journal of Biomedical Research, you are advised to pay attention to fundamental issues of research ethics in future correspondences with the journal. 1. Did anyone copy read it? The references are appalling. Also the most recent reference is 1993 which should have raised some questions about the timing of the research. 2. Did they approach anyone working in that area to review? If they had approached the author of the most recently referenced paper, it would have solved the problem, as he is author of the plagiarised paper.